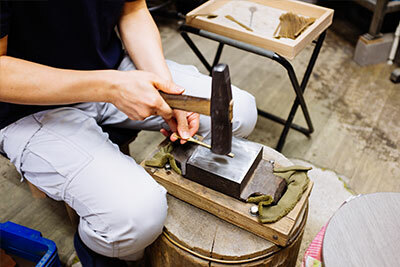 Japanese craftsman Rieko Fujimoto graduated from the Osaka University of Arts in 2002 where she studied metalworking. 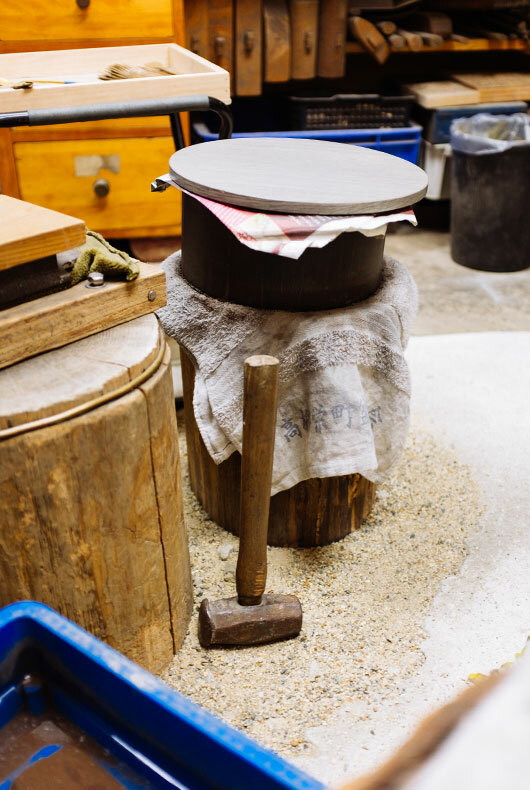 After she was then employed in local cookware shops to produce designs for their collection. 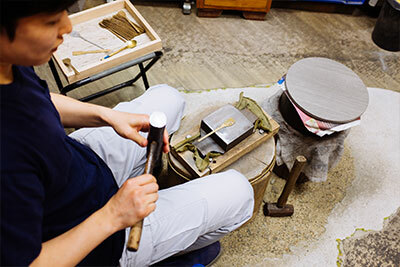 After working in manufacturing she decided to leave for a simpler life, studying with Shigeru Terachi, who is also a well regarded metal craftsman, and has now been working independently for many years. 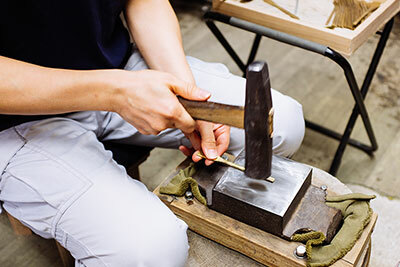 Rieko uses basic tools, she then pounds the form into a specific functional shape that can hopefully stand the test of time. 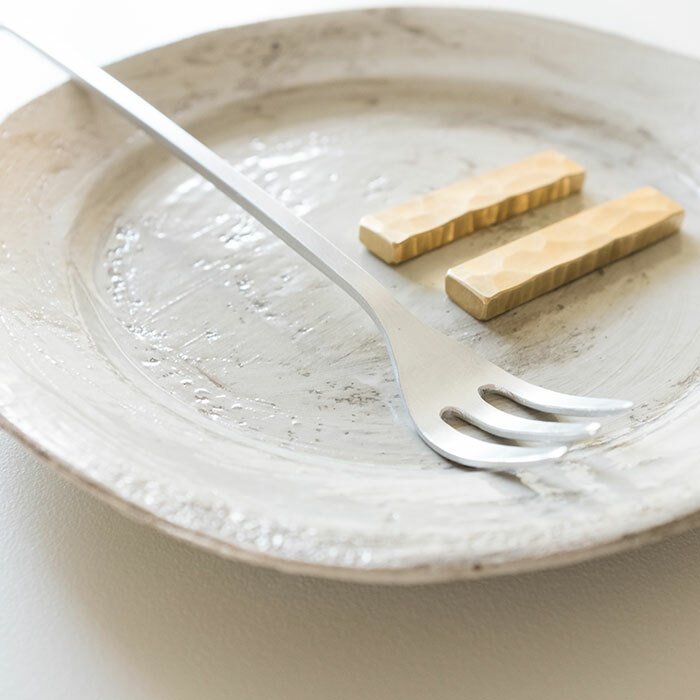 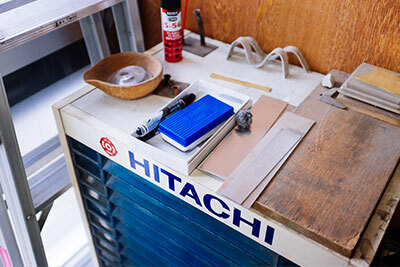 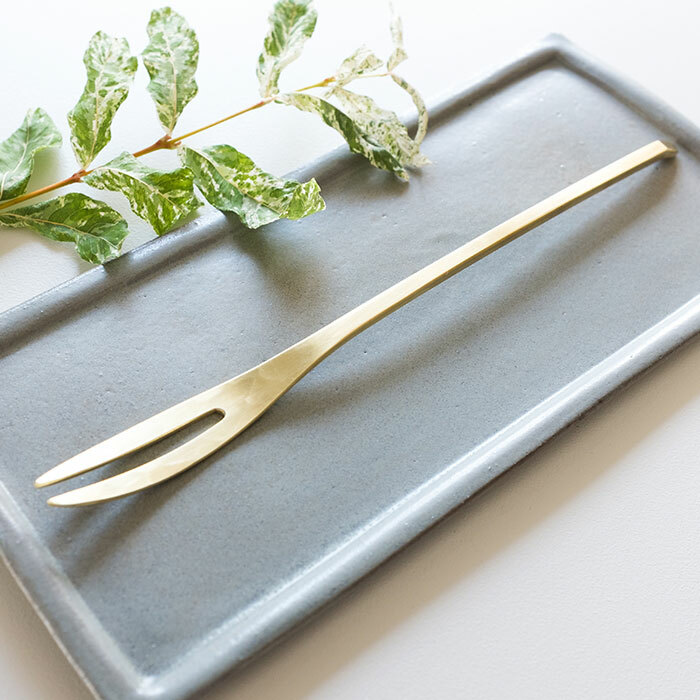 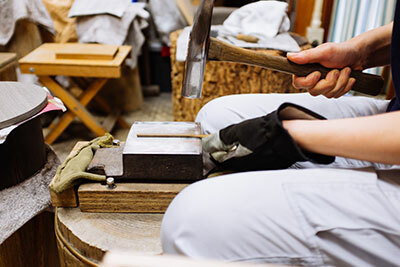 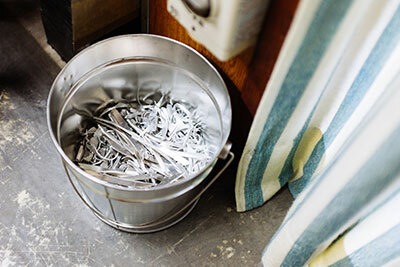 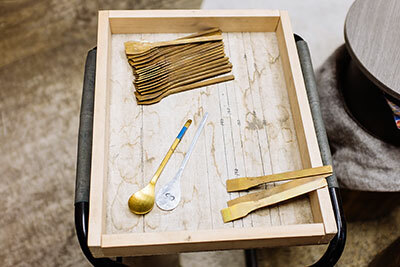 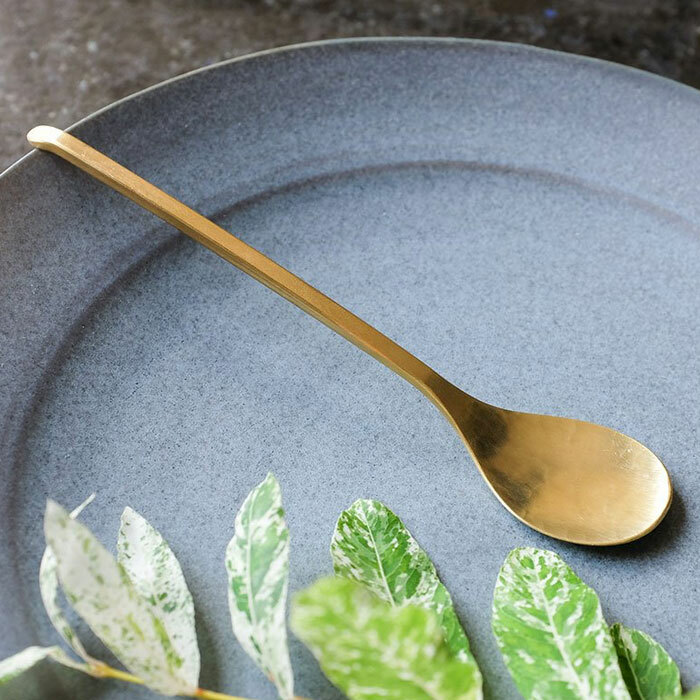 In a quiet city called Neyagawa, located in Osaka Prefecture, resides maker Rieko Fujimoto, a metalworker who hand produces functional cutlery and utensils from brass and aluminium. 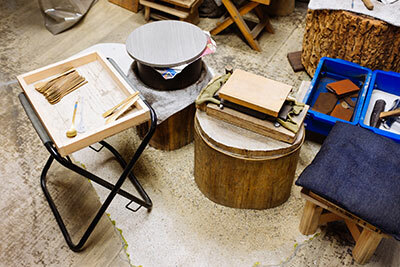 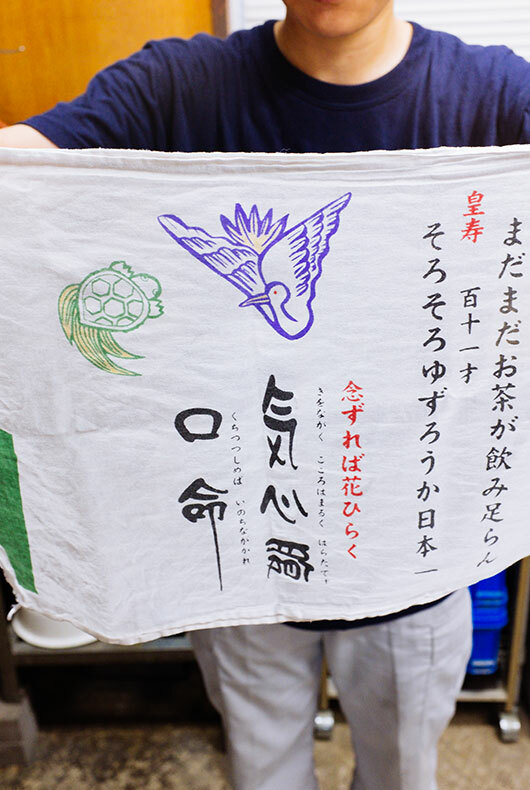 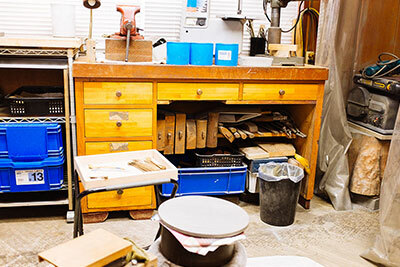 Her studio is quaint and features a wide array of tools, some dating back to the Edo period and others given to her by craftsmen that she has worked with and learnt from along the way. 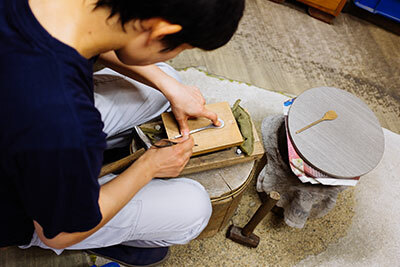 Rieko Fujimoto’s objects are small but functional, the precision and skill needed to produce such works is something to be admired and should give new meaning to the way in which we view such objects. 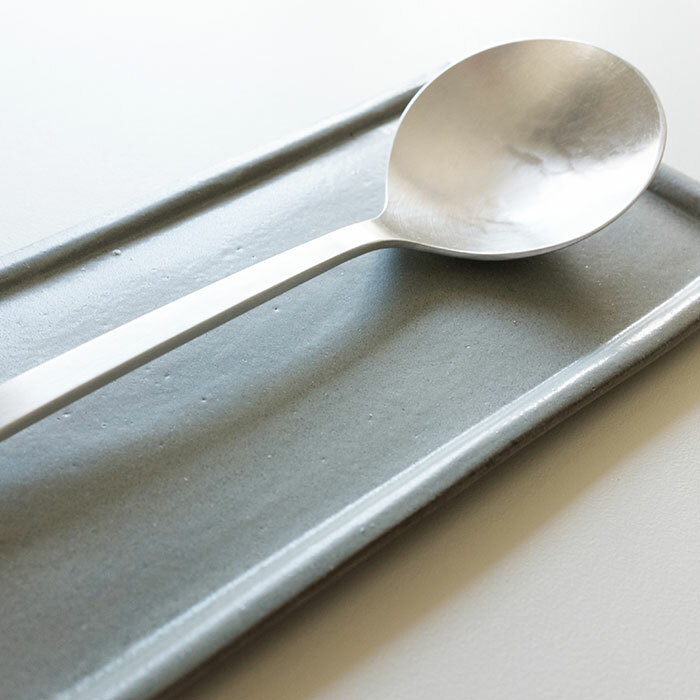 Simplicity is often a deception, an illusion in the sense that it hides many of the intricacies that make it easy for us as humans to use them and function around them on a daily basis. 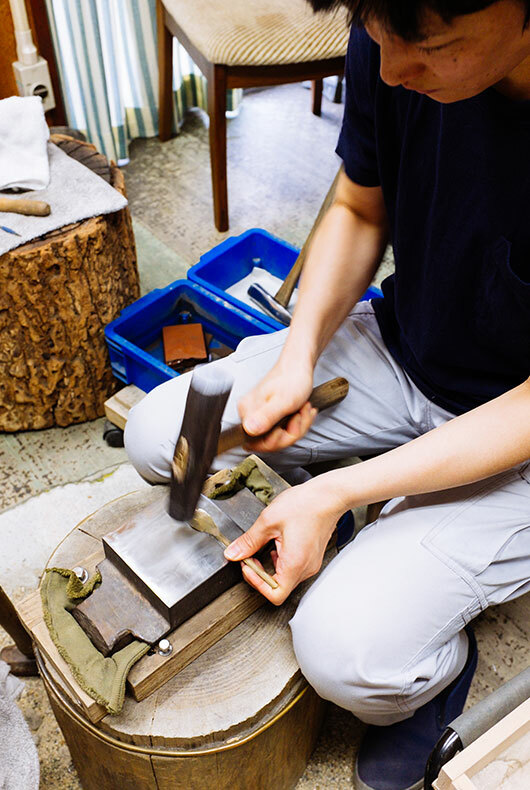 Rieko is skilled at noticing all the important elements, but at the same time hiding them within the design itself, it’s only when touched and felt in ones hand can you understand some of the complexities hiding beneath the surface. 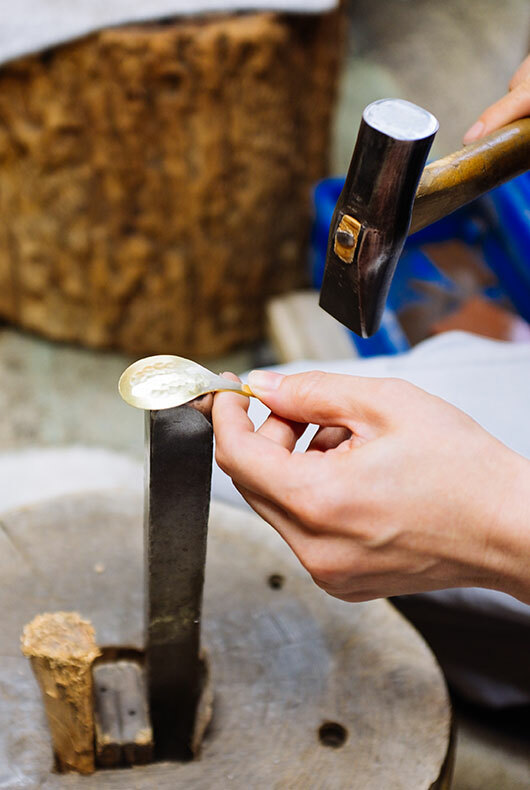 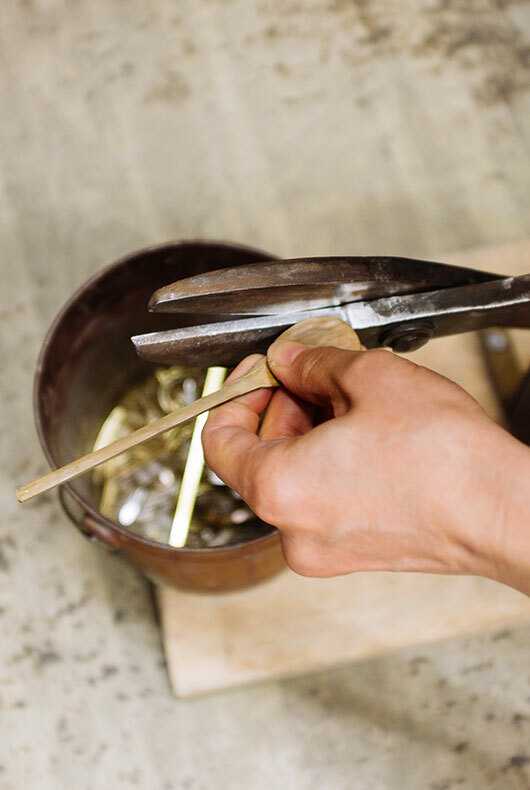 So we were lucky enough to visit Rieko’s studio to see in detail how she makes one her most popular items in the shop, the brass coffee spoon. 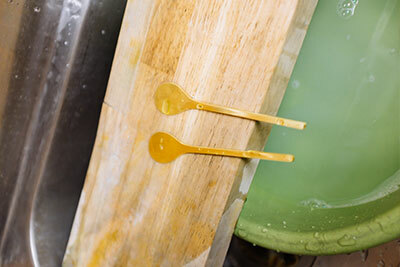 Hopefully these photos will give you a glimpse in to the process and the different stages she goes through to get such a polished article. 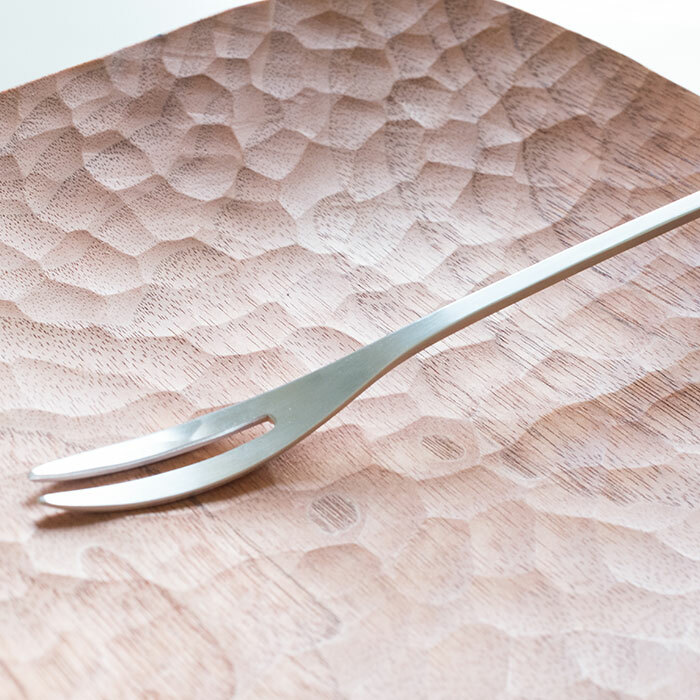 If you’re interested in purchasing some of her crafted cutlery we have a selection available to purchase in the shop. 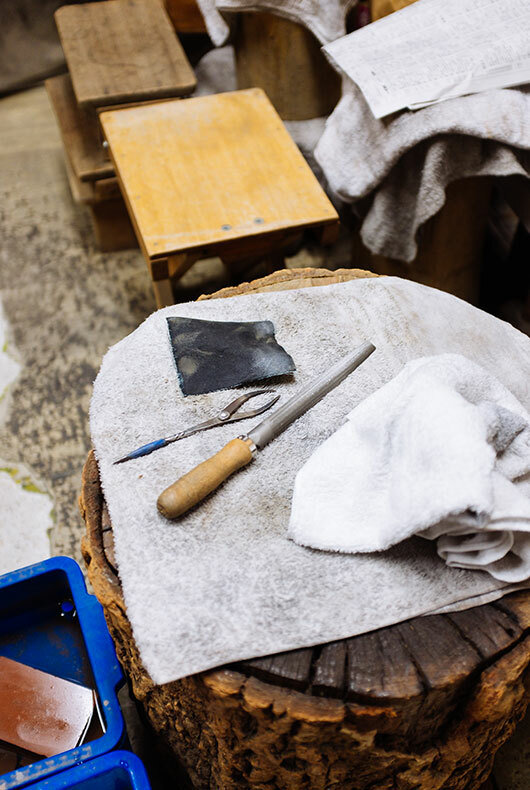 From the top of the feature you will see the coffee spoon start off as a blank, she hammers and flattens the form whilst it is hot, later cutting the basic shape and placing it in acid. 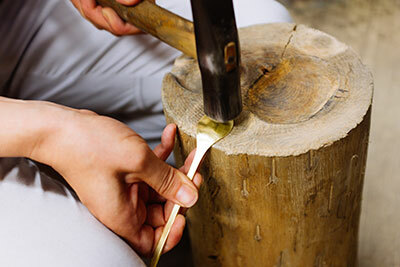 After she smooths the form and works the mouth of the spoon using an old cherry tree, later polishing each piece and removing any sharp edges. 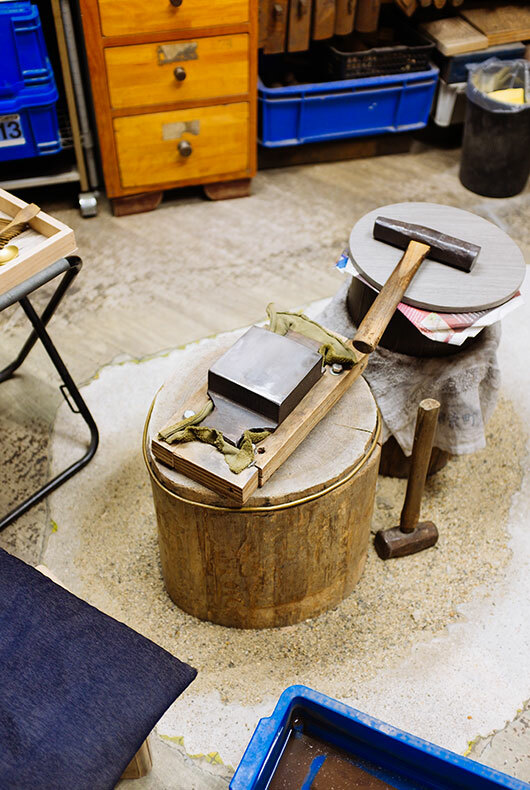 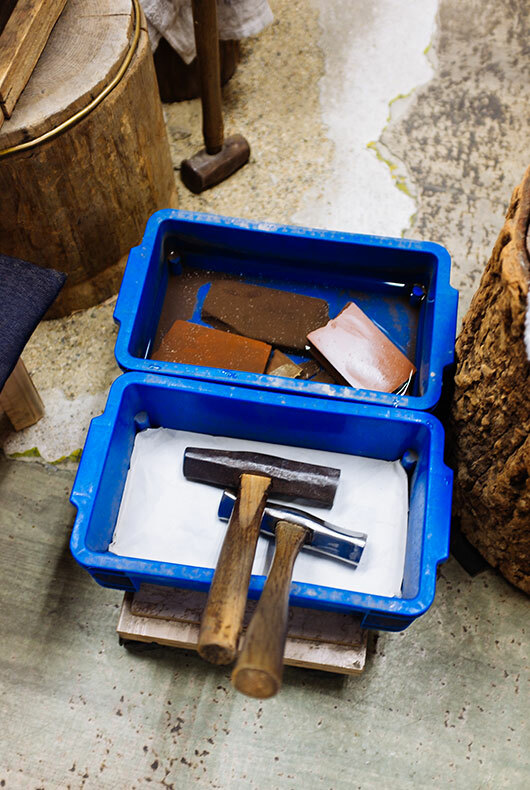 Hammers and sharpening stones waiting to be used inside the studio of Japanese metalworker Rieko Fujimoto. 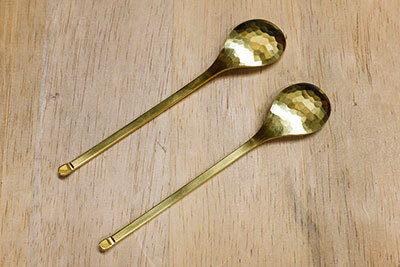 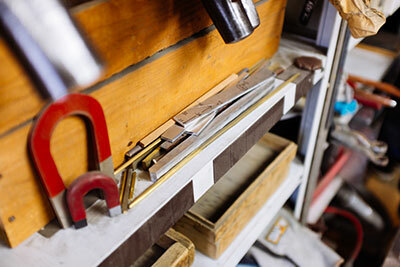 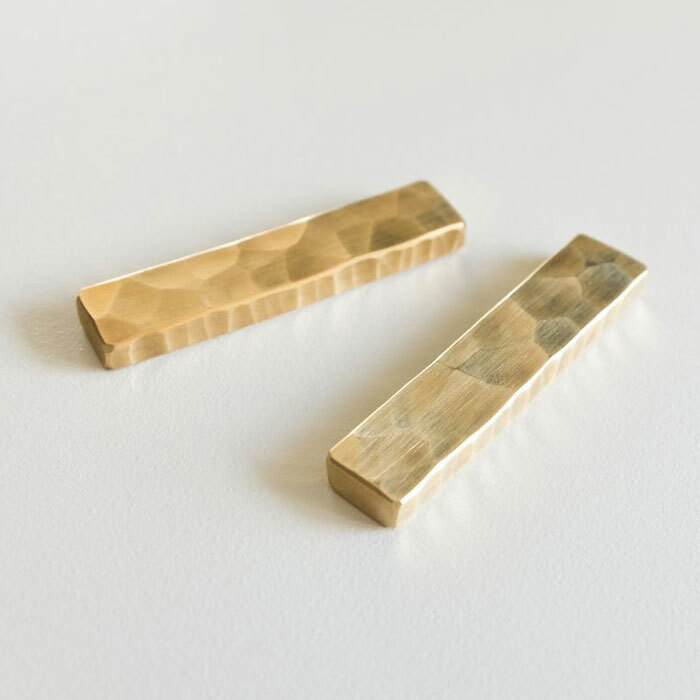 The brass blanks and spoon template that Rieko Fujimoto uses to craft in to the Brass Coffee Spoon. 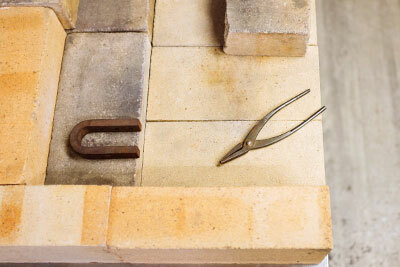 Brick table used to heat up the cutlery, after the cutlery will be hammered in to shape. 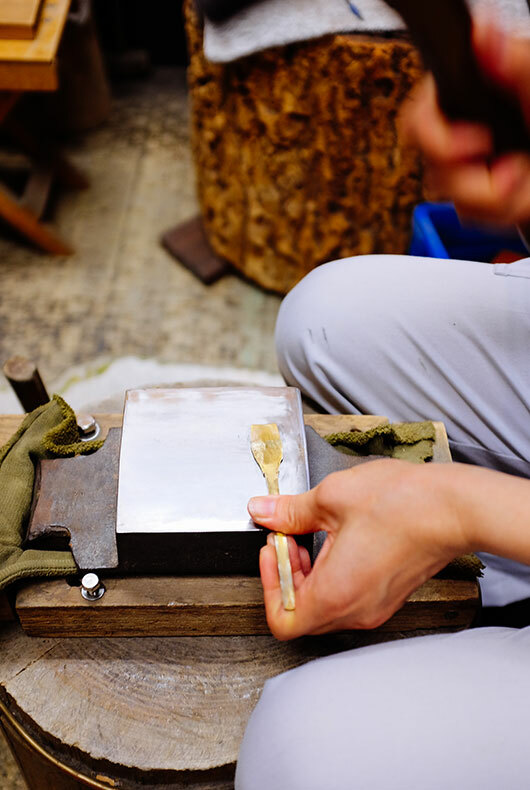 Rieko Fujimoto starts to hammer the blank, working to flatten the metal so it becomes thinner and thinner. 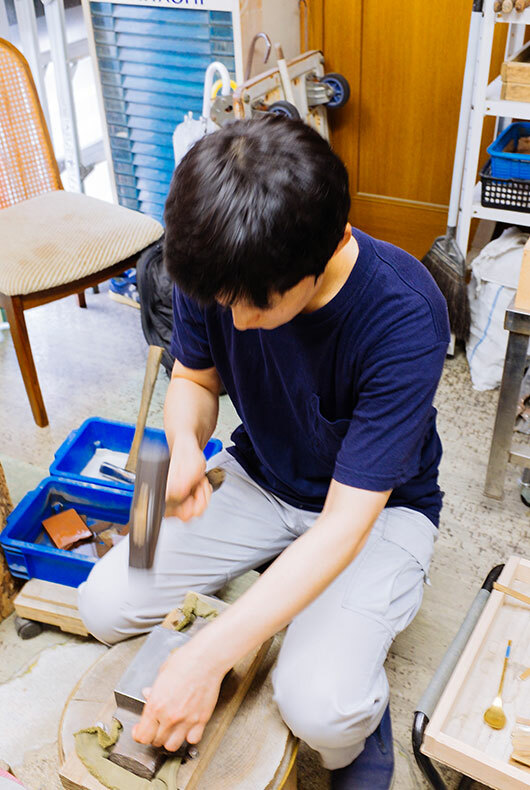 Rieko starts to hammer the handle, making it thinner and flatter, later it will be squared off slightly and tapered at the end. 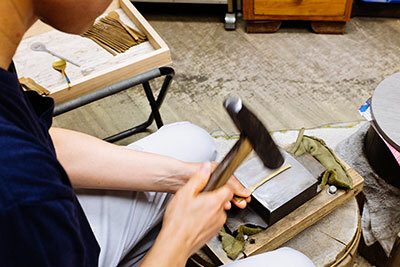 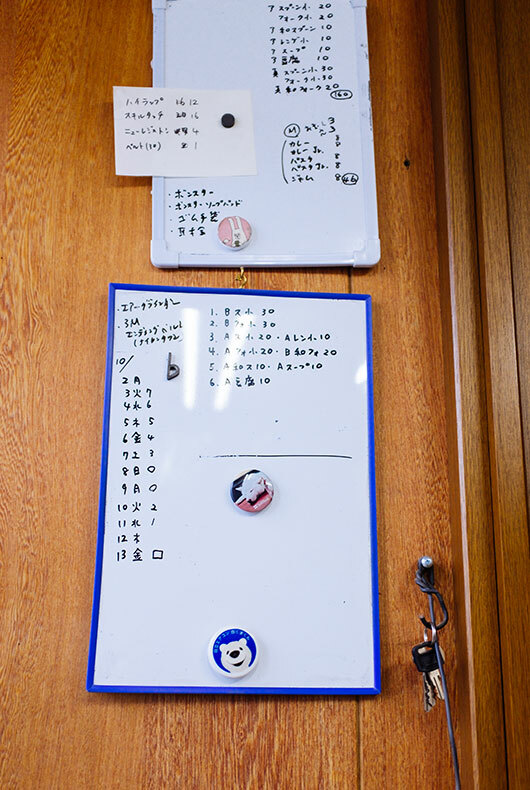 Rieko switches between the different blanks, meaning she can work as efficiently as possible. 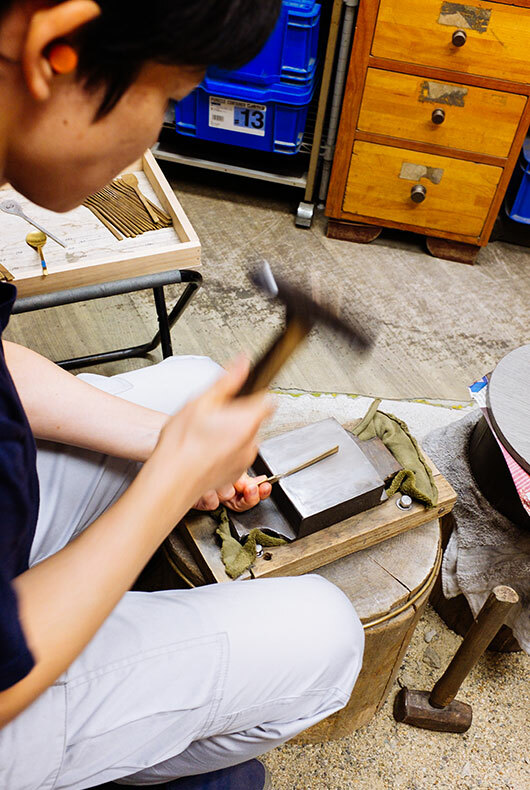 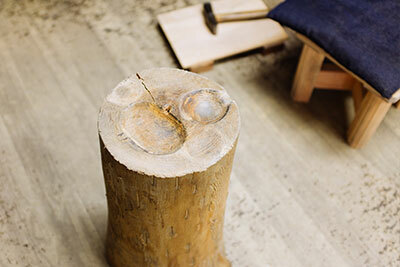 After hammering the blank to make it flatter, Rieko starts to heat up the blank so it is more malleable. 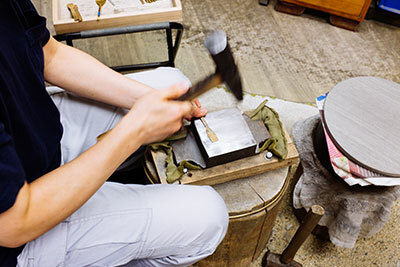 As the metal is hot, Rieko uses a glove to hold the spoon and hammer the form in to shape. 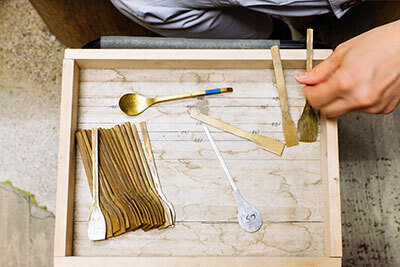 Next the craftsman uses a template to mark out the specific size for each spoon. 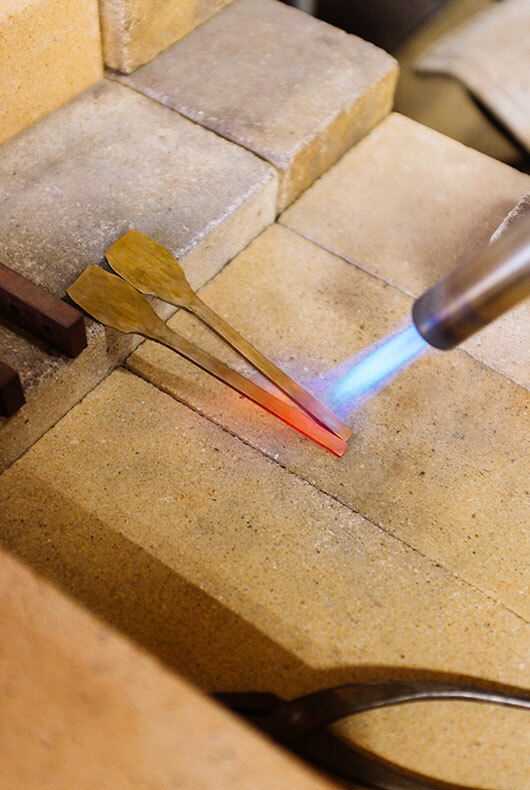 Cutting the spoon in to shape using a special set of metal cutters. 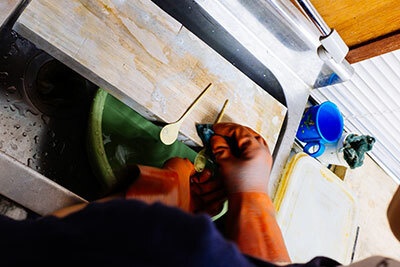 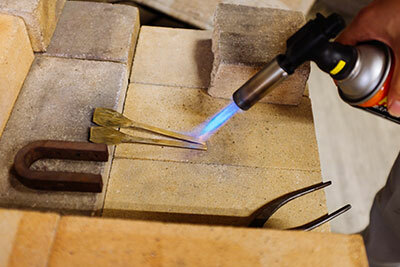 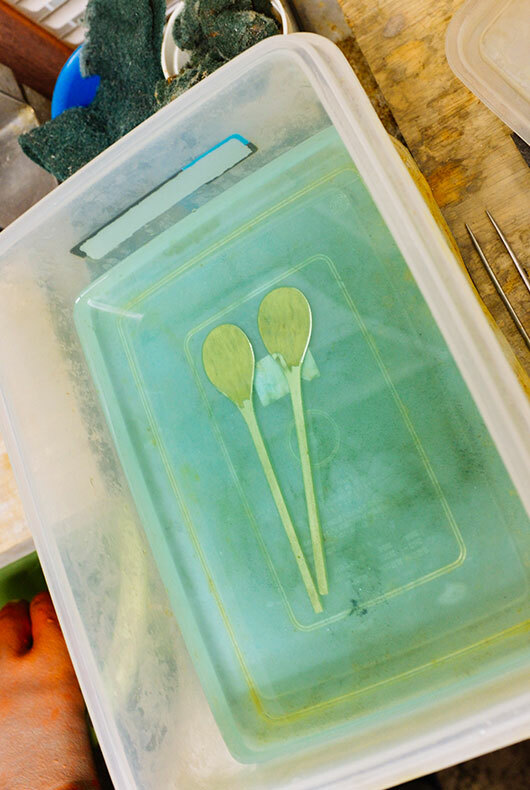 Placing the spoons in to acid, this will bring out the colour in the brass and clean the surface of the metal. 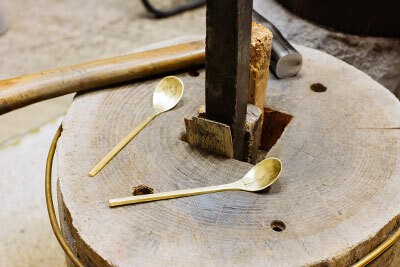 Brass spoons after being washed, these will now be shaped and hammered in to their functional form. 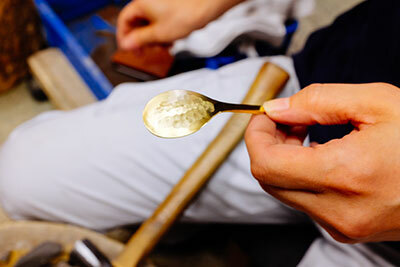 First Rieko starts with the mouth of the spoon, using a long piece of metal to make the curve for the mouth. 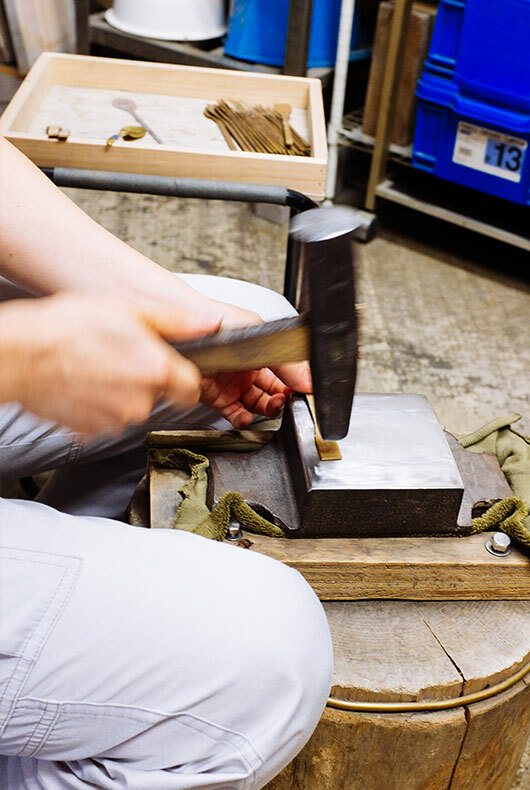 Markings from the hammering process, these are made as Rieko’s hammer hits the metal. 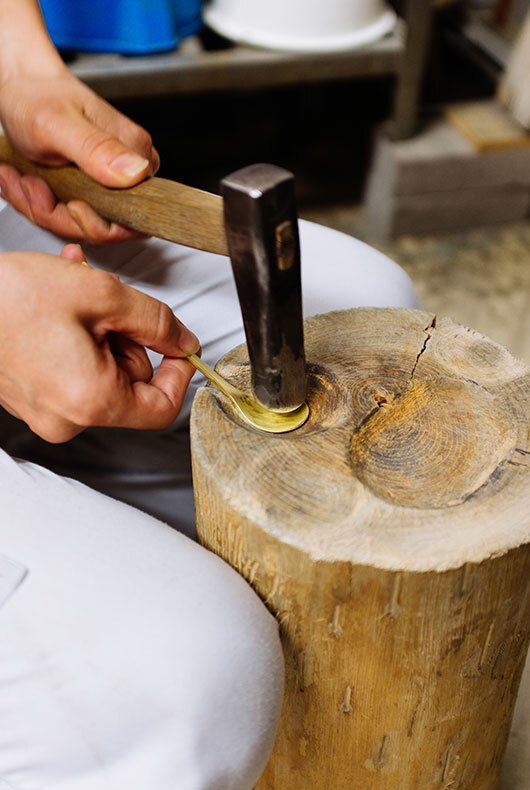 Using a special cherry tree which dates back many years, using the carved portion as a mould she can start to shape the spoons by hand. 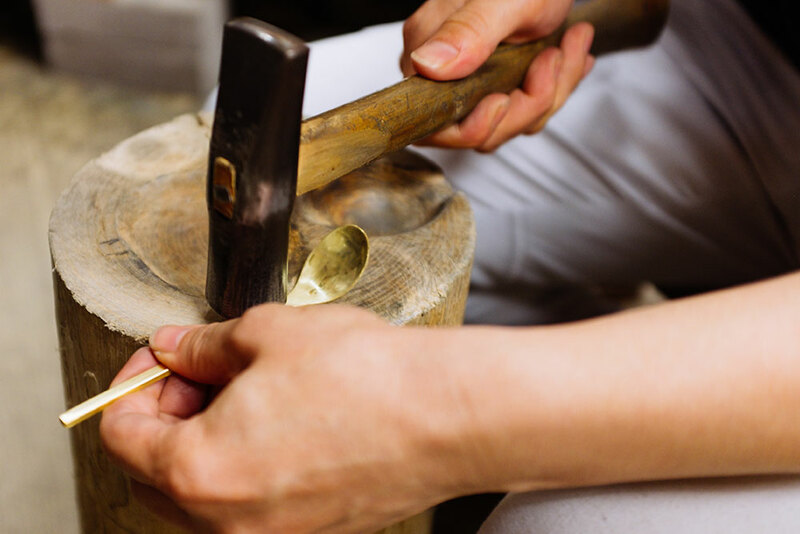 She works on the mouth of the spoon, making sure it curves nicely and flows in a functional sense. 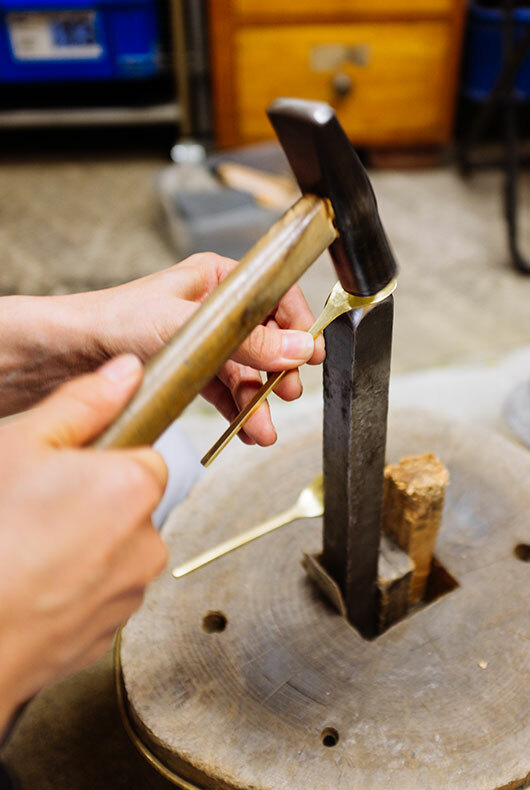 Next she works on the handle, slowly hammering the neck of the spoon. 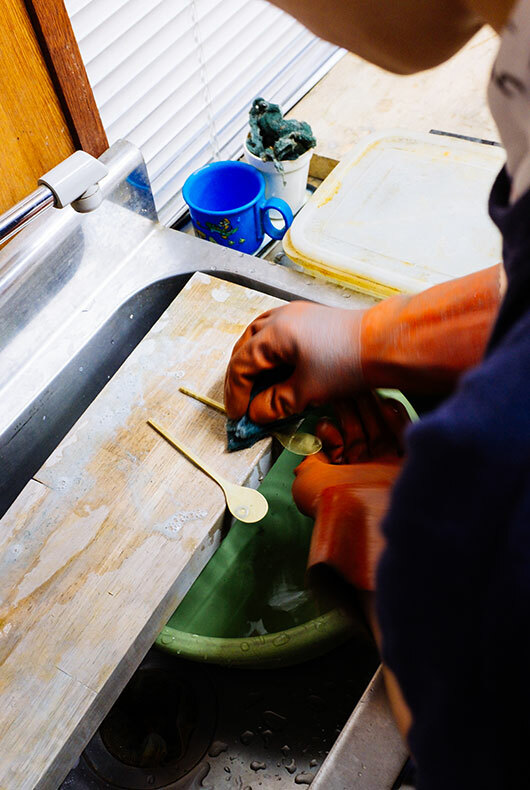 The back of the spoon is very important, she gentle taps the hammer on the underside of the spoon to shape it properly. 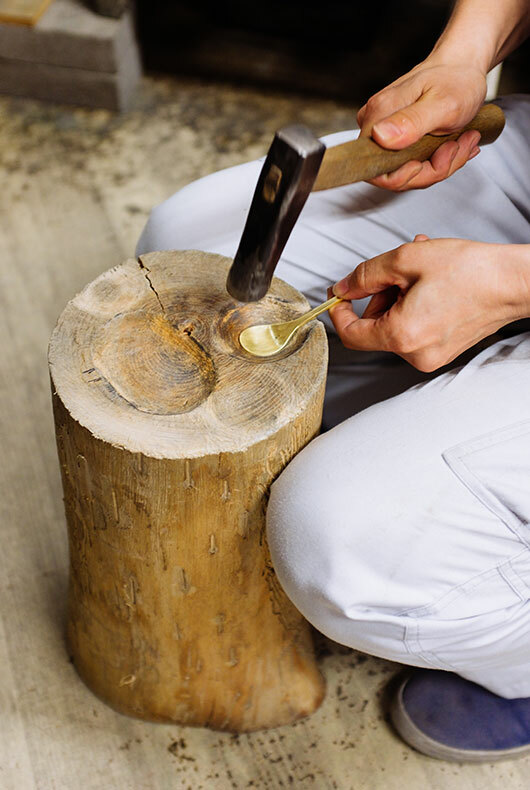 Tapering off the end of the spoon with the hammer. 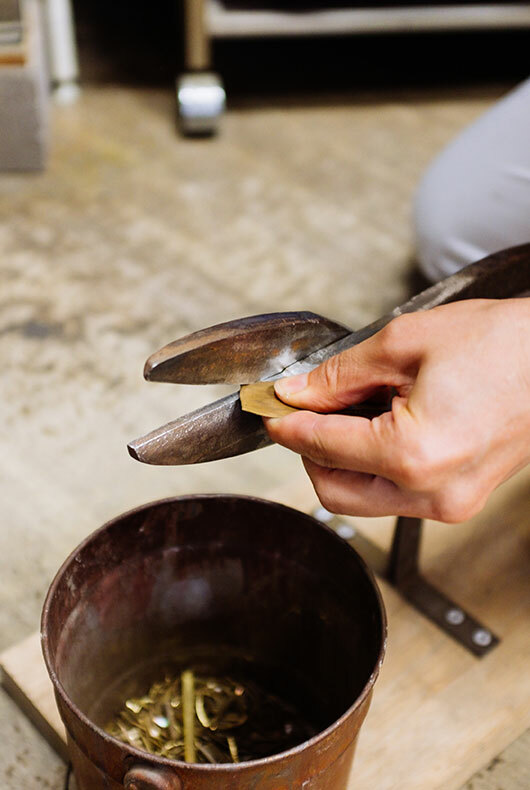 Finished brass coffee spoon inside of Rieko Fujimoto’s studio, beautiful diamond markings from her hammer on the underside of the spoon.